Moist, packed with apples and yummy! These muffins were conceived because you all loved our Blueberry Muffins so much and asked if they could be made with apples… It seemed like a great idea, so we made a few tweaks and created the yummiest Apple Cinnamon Muffins with the same great texture! 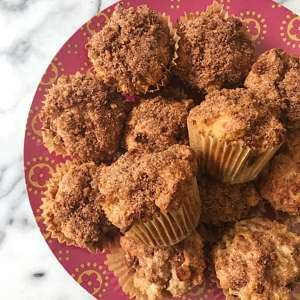 Definitely a new Fall favorite, these muffins are moist, light, packed with apples and topped with the yummiest cinnamon sugar crumble! Just like the blueberry ones, these muffins are very adaptable to tastes or dietary needs. They can be made them with dairy-free butter sticks, ghee and regular butter. You can use cane sugar and coconut sugar. And I’ve made them with milk based and almond milk yogurt. Each time the recipe works. My personal favorite is baking them with ghee, coconut sugar and almond milk yogurt. And the cinnamon sugar crumble has chopped walnuts which add a nice surprise of texture and flavor but could be easily omitted if you have a nut allergy. No matter your preference, give them a try. They are so yummy! Moist, light, packed with apples, and topped with cinnamon sugar crumble, these muffins are a new Fall favorite! They stay fresh for several days and freeze well. NOTE: prep time includes letting batter rest for 25 minutes -- only 15 minutes active time. 2 cups apples, skin removed, cup into small cubes. In a large bowl, whisk together flour, baking powder, salt, and cinnamon. In a separate bowl, whisk together sugar, melted butter, yogurt, eggs and vanilla until well combined. Gently fold in apples until evenly distributed. While batter rests, combine Cinnamon Sugar Crumble ingredients in a small bowl and set aside. Top muffins with cinnamon sugar crumble. Your instructions, step 10 tip is incomplete. They look delicious and I’m going to try the recipe. Thanks. Oops! Sometimes mistakes happen! Luckily that step is about cooking tips and wouldn’t have impacted the recipe… THANK YOU so much for pointing it out! Correcting now! And let me know how you like them! I just made these and they turned out perfect! Thank you for the recipe! Great! So glad you love them! Thanks for sharing!